XMLmind DITA Converter (ditac for short) allows to convert the most complex DITA 1.0, 1.1. 1.2 and 1.3 documents to production-quality XHTML 1.0, XHTML 1.1, HTML 4.01, Web Help, Java™ Help, HTML Help, Eclipse Help, EPUB, PDF, PostScript®, RTF (can be opened in Word 2000+), WordprocessingML (can be opened in Word 2003+), Office Open XML (.docx, can be opened in Word 2007+), OpenOffice (.odt, can be opened in OpenOffice/LibreOffice 2+). The first part of this document explains how to install and use ditac. The target audience for this part is the DITA author. The second part of this document explains how to customize the output of ditac. The target audience for this part is the DITA consultant. The third part of this document explains how to embed ditac in a Java™ application. The target audience for this part is the Java™ programmer. You'll find at the end of this document an appendix detailing the limitations and implementation specificities of ditac. Please refer to this appendix before posting support requests to the ditac-support@xmlmind.com , public, moderated, mailing list. 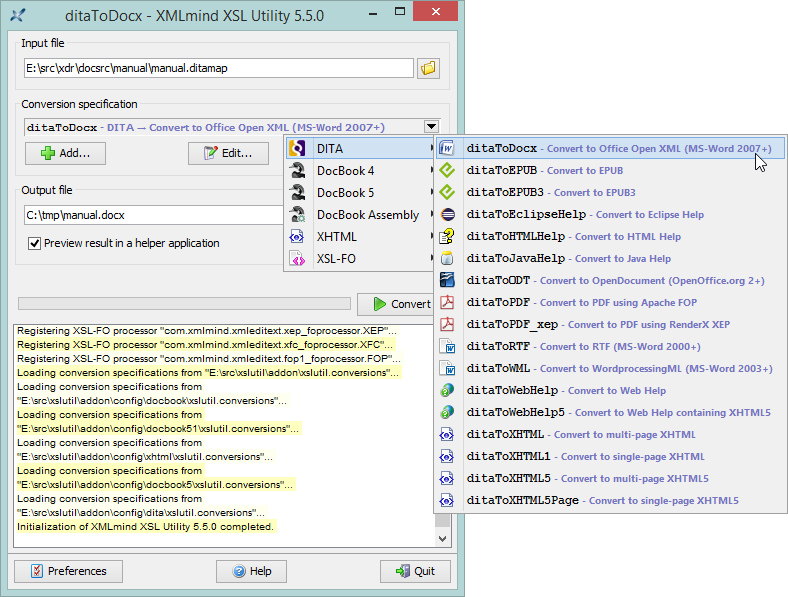 XMLmind DITA Converter has been integrated to XMLmind XSL Utility , which is part of the XMLmind XSL-FO Converter commercial product. Unlike ditac, which is a command-line utility, XMLmind XSL Utility is a graphical tool. It makes it easy parameterizing the DITA conversion process and then performing document conversions. Moreover, this graphical tool comes in a Windows, auto-installable, self-contained, setup.exe distribution(1) which includes Apache FOP , XMLmind XSL-FO Converter and ditac. If you just want to quickly and easily evaluate all the potential of ditac, you may want to download XMLmind XSL Utility Evaluation Edition from XMLmind XSL-FO Converter web site . Do not be surprised because XMLmind XSL Utility Evaluation Edition generates output containing random duplicate letters. Of course, this does not happen with Professional Edition! (1) Of course, a .zip distribution is also available for platforms other than Windows.